One of the most commented queries by our readers was related to the remote desktop connection. So, Today we are giving an interesting tutorial about how to use Remote Desktop to connect to a Windows 10 PC. Let just start with, what exactly is a Remote Desktop Connection? A Remote Desktop Connection allows Windows PC to have remote access to a distant computer using a local network or a public IP connection. Remote Desktop Public IP connection is established using the internet. For example, Mr. Smith wants his computer to connect to another computer in his office. He can do this by establishing a Remote Desktop Connection over a local network. Another time, Mr. Smith wants to connect with a computer from another country. This can be done with the help of Remote Desktop Connection using a public IP connection. So what is the advantage of doing so? Microsoft Remote Desktop Connection helps us to remote login and access files of the connected computer device. We can view and modify them. This is highly helpful in case we want to provide any Remote assistance to our co-workers, clients friends or relatives. As useful as it sounds, it is as easy to establish a Remote Desktop Connection. All you need to do is follow our instructions as given below. We will also guide you about how to use the Remote Desktop connection in Windows 10 Desktop. 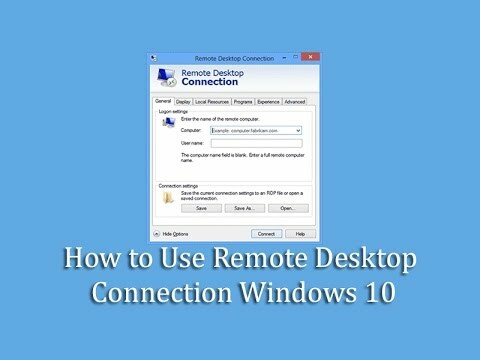 Please follow the given steps to enable a Remote Desktop Connection on Windows10. 1#The very first step is to, right click on the computer you want to connect. This PC will be used to establish a Remote Desktop Connection. Click on the start button on an active PC/Laptop. 2# When you click on the start button, you can find a list of options. Scroll down and select System. 3# From here we need to enable the Remote Settings. To do so, Click on Remote Settings. 4# Now, Please select the option ” allow remote connection on this computer“. 5# Now click on “Select Users ” just on the right bottom of the checkbox given below. 6# Click on “Add,” if you want more users to share the remote desktop access you are establishing. This means that the connection will be shaped like a local network among multi-users. 7# You can now choose the usernames with whom you want to select to share remote access. Skip this step if you don’t want to share your remote access connection with other people. 8# Once you have decided whom all to share your remote connection with, just click on OK. This will take you to the next step. 9# Once we are done with this step, we need to make sure that Windows Firewall allows remote connection access. Windows firewall prevents establishing a remote connection by default. Firewall performs this action to make sure there is no Security breach or privacy concern. Go to Control panel and select Windows firewall. 10# Once we click on Windows Firewall, we now click on “Allow an app or feature through Windows Firewall”. Doing this Setting, we permit the system to connect to another network. 11# Once done with the previous step. You need to click on “Change settings” option. You need to perform the following steps to change settings in Windows Firewall To Use remote desktop to connect to a Windows 10 PC. Scroll down and locate remote settings. Once you are done completing this step. Click on “OK” to apply your settings. Exit from Control panel and return to home screen. 12# The next task is we need to make sure that we have a user account password which we can share remote access with a local network or IP connection network. 13# When you click on the User Account, choose Manage Accounts. Please Choose the account you want to manage. 14# After clicking on your account, you will meet with multiple options. Choose to create a password among them. 15# Once you set in here, you will get blank spaces to create your password. Create a password for yourself and click on Create Password to confirm it. 16# The next is to know the IP address. How to find IP address Windows 10? For this, you need to perform the following steps. Locate and choose Command Prompt (Admin). 17# You will see the Command prompt window is open. This window contains information about your system and internet connection. Try to locate IPv4 Address and note down the 11 digit numerical data given in front of it. This goes in the format as “123. 456. 78. 901”. This address will be used to connect your PC using a Remote Desktop connection via local network or IP network. Once you discover your IP address, Close the Command Prompt Window and return to Home Screen. Must Read: Get Help With File Explorer In Windows 10? Final Steps to how to use Remote Desktop to Connect to a Windows 10 PC? Using a Microsoft Remote Desktop Connection on is simple and easy in a Windows 10 PC. Just grab another PC Or Laptop to connect with the PC configured above. We need to feed the details of the system Configured by us earlier in this post into the new system to establish a Remote Desktop Connection. Still wondering How to use Remote Desktop to Connect to a Windows 10 PC, Just follow the given steps. 1) Get your hands to a new PC or Laptop. 2)Go to search bar and type remote desktop connection. Open remote desktop connection dialogue box. Fill the IP address and click on connect. 4) Once done with this step, All we need to do is to Fill the username and password we created on step no 15. 5) Congratulation, you are now remotely connected to another Windows 10 PC using a Remote Desktop Connection. Read: How To Change Ringtone In Windows 10 Mobile? Microsoft Remote Desktop is a great utility App. We left no stones unturned to clear your doubts regarding how to use remote desktop to a Windows 10 PC. There are many Benefits if we use Remote desktop connection on a Windows 10 PC. Ranging from having a co-working access to provide support to people in need. In case of any query or suggestion, Please comment on this article. Feel free to share this information on your social media circles to educate others. Previous articleHow To Get Help In Windows 10 ? Next articleHow to Change Ringtone in Windows 10 Mobile?